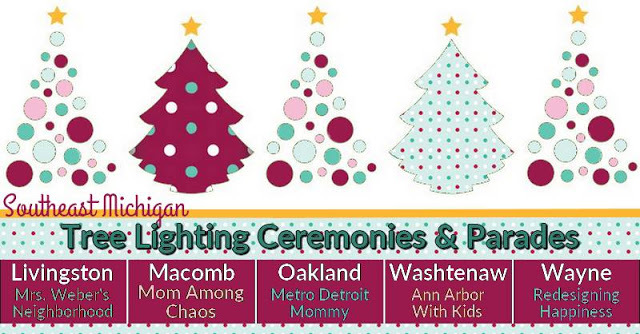 Mom Among Chaos has teamed with a fantastic group of local bloggers to provide you with a comprehensive list of local Metro Detroit Tree Lighting Ceremonies. Description: Our Santa’s Lighted Parade will begin at 6:00 pm on Friday, November 17, 2017 (this is the Friday before Thanksgiving). Santa will receive the key to the city and the City Christmas tree will be lighted immediately following the parade, plaques will be awarded to the Best Lighted entries at the stage in Palmer Park. Description: We're kicking off the Holiday season with some festive fun including a small craft project, coloring contest, visits with Santa, cookies, Biggby Coffee, Texas Roadhouse, and new this year Emerson's By the Bay! Description: 17th ANNUAL CHRISTMAS TREE LIGHTING CEREMONY: Wednesday, December 6th. Santa Claus is coming to town! The fun starts at 7pm, to include wagon rides, food, crafts, games, the anticipated tree lighting, and of course, a visit with Santa! 7pm to 9pm. New this year is our North Pole mailbox, where you can mail your letters to Santa all throughout the month of December. Description: Come see Santa and join us to share the spirit of Christmas on the Shelby Township Municipal Grounds as we light the big tree for the first time this year. Festivities include: visit from Santa Claus after he lights the tree; free kids craft in front of Shelby Township's own Polar Express; Christmas caroling; enjoy cookies and hot cocoa at Santa's snack shop; Marshmallow roast; and horse-drawn wagon rides. Description: Join us for two days of festive fun, all leading up to Santa arriving at 6:30 on Sunday, November 12 at 6:30 pm to light the tree! Description: Downtown Mount Clemens hosts its 26th Annual Christmas Open House & Tree Lighting Ceremony on Friday, November 18. The festivities kick off at the Fountain Stage at 5:00 PM with music provided by the First Presbyterian Church Arts Academy. Santa Claus arrives by horse-drawn sleigh at 6:00 PM, and on his cue, all of the Downtown holiday decorations will be lit. Free photos with Santa will be available from 6:30 PM to 9:00 PM. Starting at 5 PM, "Santa Pass" reservations may be picked up at the Fountain Stage. Santa Passes are in half-hour intervals so that families can explore the Downtown businesses and activities without having to wait in line for photos. Passes go quickly and are issued on a first come, first served basis. Other activities include free horse-drawn trolley rides and a variety of children's activities at different Downtown businesses. Many businesses will also feature sales, giveaways, and refreshments. Did I miss a Macomb County event? Please let me know in the comments!